Also provided was a link to a set of short virtual tour videos where you can learn about the distillery, which you can take a look at on this link. A lovely light cloudy coloured, and light clear, crisp tasting beer. 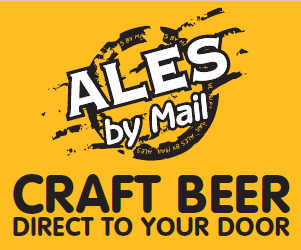 Floral and malty in style, totally easy drinking. Smoothly goes down a treat. Some light citrus around the brew and a lovely balance of sweet and dry. Had a little chew on the malted barley at this point, a lovely, lightly peated (around 20 ppm) barley, a little earthiness, but a very sweet core quickly passes and the smokey peat influence retains with the shell. It’s nice. This stuff should be breakfast cereal. Sod corn flakes. A fruity clean spirit. Lots of ripe tropical fruits. Stewed buttery corn. A little smoke. It is really all about the fruit though. Tropical. Mango. Melon. All soft and flavoursome. It drinks really well as well, lots of fruit flavours and bubblegum like. The palate on it is so very oily and practically evaporates. I notice nothing harsh in the alcohol burn either. Very delectable stuff. With a touch of water we have a lot more fruit, and if anything it gets even easier drinking. Really juicy stuff, love it. Why oh why do distilleries not bottle and sell new make. Nose. Toffee rich. Lots of sherried fruits. Plump raisins. Demerara rum. Plums. Dates. Lots of sweet fruitcake. Cinnamon. Light clove. Sweet ginger. Caramel. Chocolate. Loads of lovely fattening stuff. With a little time things get very juicy fruit chewing gum. Palate. Very very sweet arrival. Quite light in the mouth. Lashings of sweet runny toffee and caramel. Lots of fruit, raisin, plum, prune. Some light spices (sweet ginger and clove) and fruitcake. Some coffee mocha notes are also very prominent. Finish. Medium-long length. Juicy sweet, with some sweet ginger and clove, and a spot of oak. Watered. Even juicier, more fruit intensity. Some floral. Lots of sweetie shop things going on. Touches of Parma violets. Lots more fruit jam going on. And touches of earthiness. The palate reflects this earthier aspect also, and is still very fruity and heavenly to sip. The finish retains loads of fruit, a lovely warm chest and a great feel good factor. Nose. Very fruity. Stewed apple pie with a cinnamon crust. Some age to this despite its being relatively young. Old vanilla. Some furniture varnish, but light and no harshness. Something slightly vegetal. Some pencil case. Citrus juicy fruits. Touches of menthol. Touches of cigar tobacco. Some thick sugary reduction of a caramel base. Toffee sauce. Palate. Very sweet. Toffee. Vanilla. Soft fruits. Melon. Mango. Banana. Chewy. Lovely thick oily mouthfeel. Some malty biscuit. Loads of spicy vanilla. A touch of oak spice. Finish. Intensely fruity. Warming, not at all harsh considering 60%. Beautifully rich stewed fruits hang around for a very long finish. Touches of chewing a pencil right at the very end of the finish. Watered. Fruit bomb just went pop. Intensely fruity with some added spice now. More pepper and a touch of chilli. There is also a musty edge which is very refined. The palate is insanely pineapple! Loads of ripe pineapple and other tropical fruits, a chilli zing, and beautifully coating the mouth. The finish is, if anything longer, fruitier, jammier, with tonnes of tropical fruit and heartwarming going on. 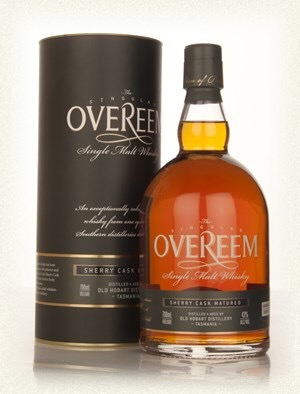 Overeem is a feel good factor whisky of some magnificence. 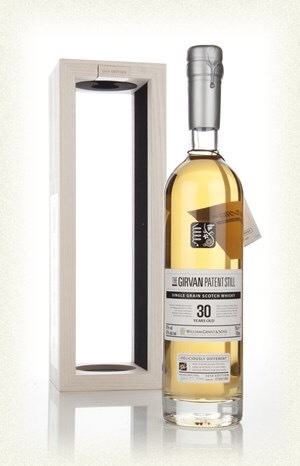 The final in my short run of The Girvan Patent Still official bottling range. The 30 year old. What were you doing 30 years ago? For some reading this you probably hadn’t even been born yet (lucky sods). Well, over 30 years ago this liquid before me was being created through a column still, and laid to rest in a barrel. Makes you think really. 30 years ago I was actually recovering from a broken femur and pee’d off that I didn’t see Ghostbusters at the cinema because I was laid up in a hospital bed bouncing their fish fingers off the walls. Anyway I digress. Let’s try the whisky. From first pour and sniff this is obviously a bit older! It really shows it. We have lots of old oak influence. Museums, polished wood furniture, varnish, glue. Old vanilla. A touch of dunnage warehouse. Leaving it in the glass for a while. There are more fruits coming forward now. Softer fruits. Old yellow apples. Banana. Soft oranges. A little touch of the tropics. Honeycomb. Some old mint leaves. In the spice range we have cracked black pepper, some ginger and a hint of clove. Beautifully sweet, oily arrival. Intense vanilla fudge and some coffee. Some rich ripe fruits, stewed and mushed down into lovely thick sticky jam. Spicy Banana bread. Thick toffee, sweet creamy Devon custard. This is just a pure pleasure to hold in the mouth and savour. Creamed rice desert and Creme brûlée. It’s reminding me of all the sweet creamy desert puddings I’ve ever had. Lovely lovely lovely. Spicy vanilla, creamed corn and rich oak sticks around for a long length finish. The sweet spices are ever present and the jammy fruits stick around until the very end which turns mouth drying, with some buttered overcooked toast. 1 drop. The nose has a more softer floral oakiness, losing a lot of its fruit and complexity. The palate is very much sweeter and lacking complexity. And the finish also diminished. This is old whisky and therefore understandably fragile. DO NOT WATER. Please. That’s just luxury. It is an awesome whisky. Beautiful to sip slowly and savour over a long evening. This whisky will inherently go a long way because each sip lasts much longer than your average whisky due to the richness and complexity. It’s fantastic stuff. If it were in my price range it would be my purchase of the bunch. 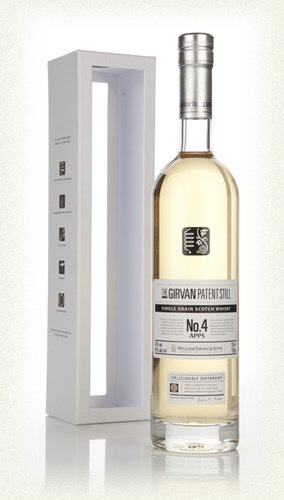 Many thanks to the Girvan Patent Still for providing the lovely tasting set. Time for another Girvan Patent Still single grain whisky. This time 25 years old. A significant jump in age from the non-aged No 4 Apps, and a significant jump in price. Let’s sip on. Rich vanilla straight from pouring and touches of nail varnish and some wood glue. Immediately and obviously more aged than No4. Very evident in terms of oak spices present. The fruit is more boiled bad own. Apples, pears and some oranges. Some light pepper and a hint of cinnamon. Touches of spearmint. Some thick caramel and a whiff of grated white chocolate. There is more prominent oak, some sawdust. Nice, complex stuff. Thick, rich and sweet arrival. Deep boiled fruits, apples, some berries, oranges. All smothered in thick melted toffee. The fruity spirit is still very alive amongst the cask influence, and the cask has done wonders to round things off and give off those vanilla spices, and beautifully oily complexities. Dangerously easy to keep sipping. Some lovely pastry notes as well, intermingling with the cinnamon spices, it’s almost like drinking a Cinnabun. Long length finish of Baked apples, pears, thick toffee, caramel, white chocolate. Ginger and cinnamon. A touch of coffee. Drying over time and leaving some more bitter chocolate and oak behind, but those boiled apples, still there. 1 solitary drop. The nose has a little added floral and extra sweetness to the spices. The palate is also sweeter, more rounded and downright delicious. Water does definitely re-vitalise the spirit within. The finish a little shorter and more oak influenced. Personally I would probably leave this without adding water. But I can understand and respect the variation of experience. Well….dilemma time. Honestly it’s very expensive. But there is no denying this is a lovely whisky. Very tasty, honest stuff. 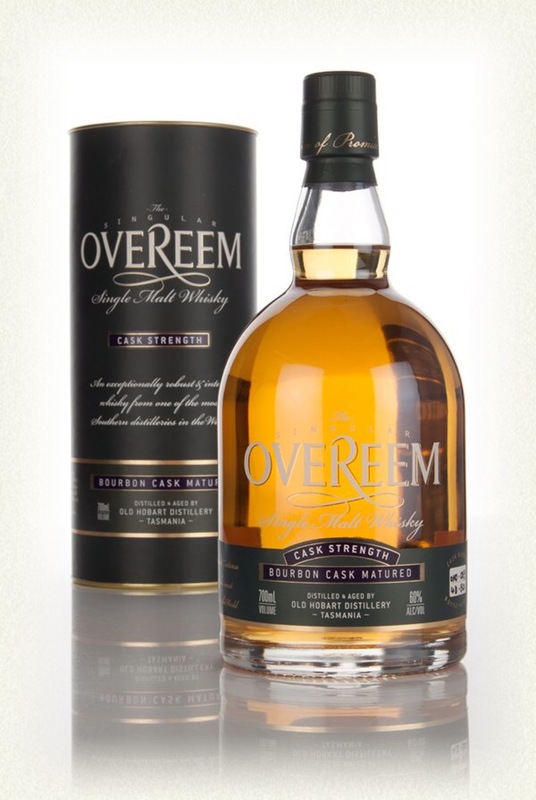 If you have the money, and want something luxurious and different to the normal malts then this is well worth the shot. 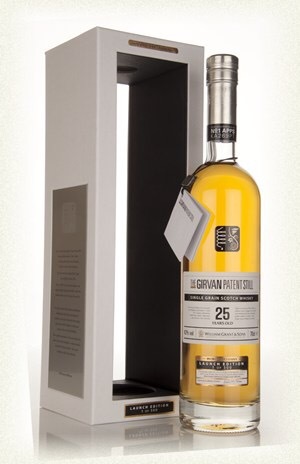 After a superb start with the new make spirit (read here), I’m onto the entry level in The Girvan Patent Still’s range. The No. 4 apps. Named after their still installed in 1992, the No 4 Apps (Apparatus) is a unique still, operated under a vacuum, permitting distillation and low temperatures. 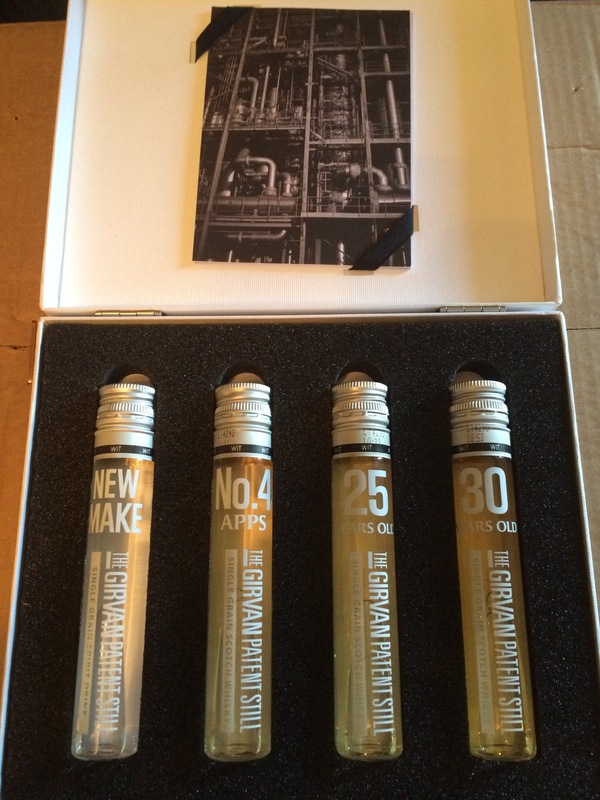 The whisky in the bottle is distilled from the No4 and No5 Apps (Stills). Subtle. Lightly sweet. Cream caramel, with some runny toffee sauce. There are some crisp apples in the background. Popcorn. Jellied soft fruit sweeties. A little touch of oak here and there. Sweet and creamy arrival. Lots of vanilla, caramel, toffee and runny honey. Some buttery corn comes through in the development, some drier toffee and tinned apples in syrup. There is a nice light oiliness to the mouth feel enabling the flavours to travel. Sweet turning dry with some oak tannins. The vanilla shines now, some ice cream and bittersweet toffee coating. Smooth as silk. No ABV burn across the board. Just creamy, smooth, easy going lushness. 4 drops added. Much more fresh fruit (apples – it’s awoken the spirit) on the nose now, with the creamy sweet notes diluted down. On the palate the fruit is more upfront as well, but there is a delicious vanilla ice cream running through the fresh apples. The finish has a little more oakiness, but those lovely crisp apple skins and custard notes stick around for a fair while considering the whisky is so young. This is lovely easy going stuff. If you want complexity then I wouldn’t say your going to get it, but if you want a lovely, easy going, drinkable (in fact to the point of dangerously so) whisky, then look no further. This is good stuff. Coming off the stills at 94% ABV, this would be more than hazardous to try at that strength. I can’t help wanting to have a sniff though. However, no chance right now. But I do have a curious test tube of the new make diluted to 42% (the same strength as the Girvan Patent Still’s official bottlings). I’m having a Girvan session. Let’s start with the new stuff. Wow. Apples. Apples. Apples. Juice! Again, hardly any alcohol burn. Very very juicy apples, freshly pressed. Straight in at the arrival, very sweet, through development. Touches of popcorn. Later on some apple pulp and peel. Apple skin, drying out. Like chewing on apple skins. Touches of sweetcorn. I really don’t want to. But adding a drop. Creamier now, with some more corn influence. Some custard with your freshly sliced apples. Palate reflects this, less intensity to the apples now, but more of a creaminess coming through. The finish is creamy and quite delicious. Why the hell cant I buy this? Or I’ll rephrase. 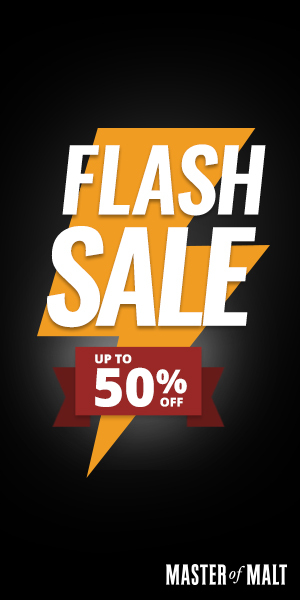 Please sell this! It’s very very nice! I like Glengoyne. 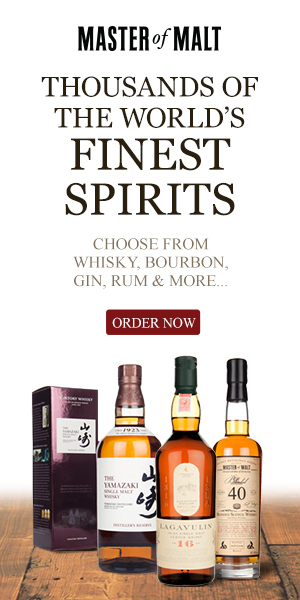 They produce some quality, traditional malts, and you cannot go wrong with any of their official bottlings. Today I’m finally having a proper go at the 21 year old. Looking forward to it immensely. Heavily sherried thick dark berry fruits. Plump raisins, figs, apricot, some orange peel. Loads of Christmas cake. More orange juice now after a few minutes. This is one of those whiskies that needs lots of time, it evolves in the glass immensely, and therefore it’s worth taking time, letting it breath and really enjoying the whole experience. With that additional time we get more depth to the sherry notes, loads of fruit cake. Pepper and clove spices, crystallised ginger. Thick, sweet, chewy toffee, heavy honey. Now there is even more varied fruit, more varied forest fruits, strawberry, blackberry, raspberry, lovely stuff. Lots of complexity and evolution. More confectionary coming through now, chocolate shop stuff, caramel, fudge, loads of fattening glory. Oooo, all that lovely sherried fruits are coming through, thick and luscious. It doesn’t have the thickest mouthfeel, but it is still nicely oily and mouthcoating. Lots of lovely forest fruit jams, toffee, honey, brown sugar, fruitcake. Lovely quality sherried dram, with no hint of sulphur. Some light orange juice coming through, with some lovely creamy fudge notes. There is a lot to this whisky. Awesome stuff. Absolutely no alcohol nip at all, it’s beautifully drinkable and enjoyable. Long length finish. The fruit jams and fruitcake make way to Barley sugar notes. Touches of werther original sweets and some lovely sherry oak dustiness at the very end. Literally a drop. Wow, more depth now, more age, some polished oak, the depth of the sherry oak is much more enhanced for that drop of water. The fruit jam has intensified, the toffee has just been thickened and made creamier with some added spice zing. The palate is just bloody glorious. The dials are all up to 11, sweet, thick intensive vanilla spiced toffee, honey, fudge, well done caramel. Very berry jam, lots of strawberry, sweet caramelised raspberries, chocolate, marmalade. Exceptionally complex and delightful. The finish, extra long now, retains so much confectionary and fruit jam for absolutely ages. Warming deep down, proper hugging, feel good whisky. I’m in love with this dram. Seriously so. I’ve been a sherried whisky fan since the beginning, but this comes down to the ultimate in terms of satisfaction, drink ability, enjoyability and overall best experience going. It’s not a cheap whisky. But it is absolutely quality and well worth the money. 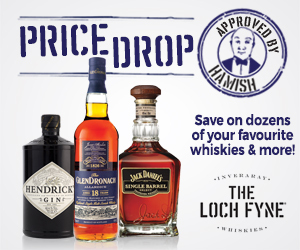 If you want to treat yourself and you are a bit of a sherry head when it comes to your whiskies. You cannot fail with this bottle. It’s also available as a 20cl and you know what, more distilleries should do this with their older whiskies. It’s the way I got to try it in the first place, and it resulted in a full bottle purchase! Very fruity and jammy. A touch of fresh pineapple on first whiff. Turns more berry rich in the fruits with blackberry, cranberry and strawberries all there in abundance. There is also touches of orange. All juices, ripe and scrummy. There is a creamy background, some vanilla and a touch of oak spice. With time in the glass we get a little more age, dusty oak and dried fruits, pineapple again, this time dry and more like pineapple cubes. The arrival is quite steady, gentle and sweet, but there is a very long development of Waxy fruit juices (apple, orange, mixed berries) and subtle spices. The mouthfeel is thick and coating. Wave after wave of fruit bursts forward along with a touch of pepper or sweet ginger. There is some fruit cream sweets also amongst the experience, along with some citrus oak. More subtlety, but long with it. Lots of those fruit juices and waxiness remains and some lightly drying oak presence. There a gentle tingle of effervescence and a lovely warm feeling on the chest. Just the tiniest drop added. More age is prominent on the nose now, more dusty oak, bookshelves, leather now coexists with the fruit and almost takes your breath away. The is an extra edge of spice also. The palate remains very fruity and sumptuous, although the mouthfeel is weakened a tad. The finish long, dustier, older, a little spicier, always delicious. This is no bruiser. It’s a gentle, caressing whisky. One to contemplate on and enhance a relaxing evening. Beautiful stuff. Thanks to Wemyss for providing a review sample. A brand new addition to the core Benriach range today. This is their new 10 year old expression. Bottled at 43% and stating non-chill filtration and natural colouring on the packaging, this bodes very interesting indeed. Lively, fresh and crisp pears on first pour. There’s a little spirit about the nose, after some time in the glass this lessens and more green fruits are forefront. Green apples, pears, a touch of the tropics. The fruit has a honey coating. Touches of light toffee and runny syrup. Some ginger ale. After some more time there is some forest fruit elements, hints of fruitcake and touches of floral hand wash (in a good way). Toffee apples remain and some Candy floss. It’s quite the fairground finish. Medium-long (longer than I would expect for a 10 year old whisky) length. More spices return and a drying oak tang to finish off the experience. What a fantastic addition to Benriach’s core range. 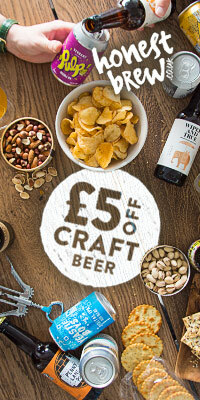 I’m so happy to see non chill filtration and natural colouring being prominent in this expression, and the increase to 43% ABV holds such amazing flavour for the relatively young age. The experience of this dram holds to that of a slightly older whisky, and it is one I want to have available to me. It’s a perfect starting dram to a tasting session, or just a perfect day to day fruity, spicy whisky experience. Lovely stuff. Recommended. 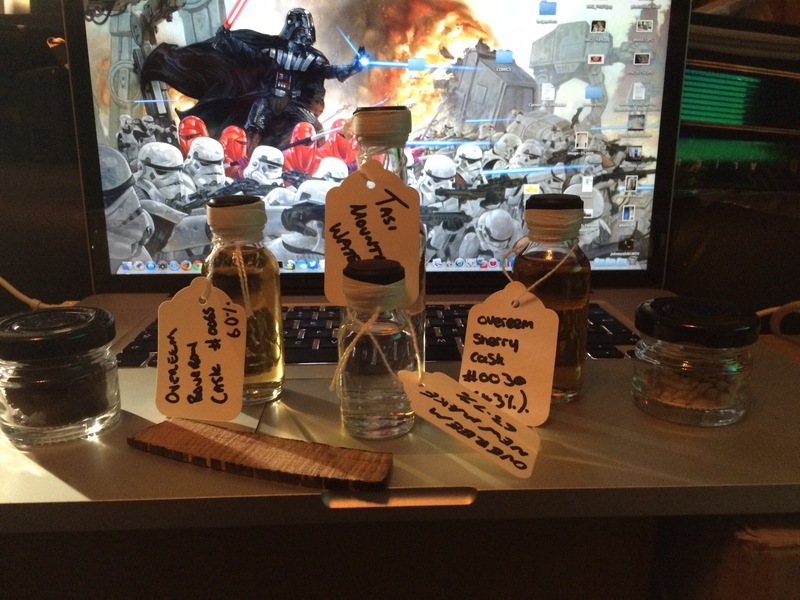 Thanks to Benriach for the review sample. More sherry bombing nonsense. 🙂 I like them though, so here we go with another one. Exciting stuff, I really like the Tamdhu 10 year old, but felt it could have had a little more punch, stronger ABV and non-chill filtration. And guess what we have here! Well, it isn’t 10 years old, it’s a NAS, but it is sherry cask matured, cask strength, non-chill filtered and no colouring! I’m excited. Let’s do this. Fudge! Lots of confectionary. Fudge dominates. We also have milk chocolate, honey and caramel. It’s surprisingly not that fruity, the sweet sugary confectionary goodness is well and truly dominant, that’s not a bad thing though, I’ve never experienced quite the intensely thick fudginess that this dram provides. There’s some morning coffee biscuits and a touch of nuttiness in the background. That sweet sticky fudge is right on the offset of the arrival. Then some quite hot spices from the high ABV. Taking a while to fade, then bringing more fudge, chocolate and honeycomb. Some nuts come forward during the development along with a little ginger and clove. Medium length finish. Ginger spice sticks around for a while as does the heat from the alcohol. We finalise with some vanilla fudge and a hint of chocolate. This does need some water. So a fair dollop added. The nose becomes a little lighter with water, lighter milk chocolate, more honeycomb now, it is very crunchie bar. The palate reflects these changes, much less heat now, so a creamier experience is had. Lots of chocolate, fudge, honey, all very thick on the palate and chewy. Lovely. The finish is creamy, and chocolatey. Still has some youth about it with some heat coming through. This is a chocolate lovers whisky! Lots of chocolate and fudgey goodness. Definitely good for someone on a diet who’s missing their sweet treats! On comparison with an opened bottle of Aberlour a’bunadh I find this dram concentrated on the confectionary and lacking in the fruit that the a’bunadh has in abundance. I think that’s a very good thing, there are some definitive differences between the sherry bombs I have tried this week. This stands out as a special whisky for me, and I will be following the batches with great interest in the future. This will be the oldest grain whisky I have tasted to date. Very exciting to try. On first pouring we have a lot of acetone. Wood thinners. Thick oak spices. A sweet presence of sugared popcorn and butter. Some very creamy vanilla custard. Spiced stewed apples. Creamy coconut milk soaked coconut flesh. Exceedingly deep, pungent and mesmerising nose. Going to let it settle a bit. With time some of the acetone/wood glue notes subside a little and there is a more creamy thick nose. There is more of a Madeira cake mix presence now alongside the butter/cream, corn and custard notes. There is now more polished oak furniture. Immense stuff. Holy holy whoh. That is big. Big, massive deep flavoursome complexity. Lots of oak, but then buckets of cream, buttery toast, thick Devon vanilla pod infused custard. Creamed corn. Coconut. Some oak char. Some strawberry jam. Hints of oranges. There is no burn of alcohol whatsoever. The mouth feel while not being overly viscous does travel the extremities very easily. Very very sweet, chewy and delicious. Very long length full finish. Dusty oak. Lots of sweet vanilla and creamy custard. Some berry jam, or maybe a touch of marmalade. Coconut again and touches of oak and burnt toast. It’s still sweet and flavoursome in the finish, not a lot of drying out, just deftly smooth and heavenly. The finish leaves a resoundingly warm sensation deep in the chest and provides a massive feel good factor. The sweet vanilla coconut taste remains on the tongue for an absolute age. Literally a drop added. If I couldn’t think this whisky could be nicer i was wrong in some ways! The added drop of water has concentrated the age on the nose, so more of the acetone and polished oak is forefront with the sweet creamy majority of the aromas taking a back step. The palate….amazing…so much deeper and creamier, the mouthfeel is more luscious and viscous now, the flavours are so sublime and deep. Not a great deal of change in the flavours more the coating and experience being improved by 20%. The finish does have the tiniest bitter orange/marmalade note mid finish now. I feel very spoilt. Much thanks to the W Club for providing a sample as part of their Tasting Club.